May 07 Depart Toronto for Tel Aviv by direct flight. May 08 Morning arrival in Tel Aviv. Transfer to Galilee. En route we visit Haifa and Mt. Carmel, the “burning place” where Elijah called the fire down to confound the prophets of Baal. Celebrate mass in Stella Maris (Star of the Sea) Church. Dinner and overnight in Nazareth. May 09 After breakfast we will travel by boat on the Sea of Galilee, visit Capernaum, home of St. Peter and the site of Christ’s preaching, see the Church of Multiplication with its beautiful 5th century fish mosaic and the Church of St. Peter’s Primacy. Celebrate mass on Mt. Beatitudes, where Jesus delivered his famous Sermon on the Mount. Dinner and overnight in Nazareth. May 10 This morning we start our tour with visiting Nazareth and the Basilica of Annunciation. We continue with visiting Mary’s Well and St. Joseph‘s carpentry shop. On to Cana – the site of Jesus’ first miracle, where couples will be able to renew their marriage vows. In the afternoon we ascent Mount Tabor – the Mount of Transfiguration. On our way back to hotel we stop at baptismal site on river Jordan. Dinner and overnight in Nazareth. May 11 Today we descent to the Dead Sea– the lowest place on earth (423 meters below sea level). The area around the Dead Sea was one of the world’s first health resorts. The salt and the minerals from the Dead Sea are used to create cosmetics and sachets which are well known around the world. Time to enjoy the sun and “swim” in the Dead Sea. In the afternoon we stop at monastery on Mount of Temptation, in Qumran, where Dead Sea scrolls where found and we see Sycamore Tree in Jericho. Dinner and overnight in Jericho. May 12 Today our journey takes us to Bethlehem where Jesus was born. We visit the oldest church in the Holy Land, the Church of Nativity at Manger Square, built over Manger cave. We celebrate Christmas mass here. We also see Crusader’s Cloister, the Grotto of St. Jerome and Shepherd Field. In the afternoon we visit the Mount of Olives, Dominus Flevit Church where Jesus cried upon prophesying the destruction of the Temple, walk through the Garden of Gethsamane, we pray at the Church of all Nations and the Pater Noster Church. Dinner and overnight in Jerusalem. May 13 We start our day with the Stations of the Cross on Via Dolorosa (Way of Sorrows). We walk the same pathway Jesus walked from Pilate’s Judgment Hall, where he was condemned to death in Calvary, the site of his crucifixion presently inside Holy Sepulchre Church. Mass in one of Jerusalem churches. In the afternoon we experience an inspiring visit to Mount Zion, home to King David’s tomb and the Upper Room where the Last Supper is said to have taken place. We visit the Church of St. Peter in Gallicantu, built on the site of the House of the High Priest Calaphas, where Jesus was imprisoned for a night. We also visit the Dormition Abbey, St. Ann’s Church and Pool of Bethesda. Dinner and overnight in Jerusalem. May 14 In the morning, we stop at Western Wall, the holiest Jewish site in the world. Afternoon journey takes us to the Ein Karem, a serene, picturesque Jerusalem suburbs, the birthplace of St. John the Baptist and the Church of Visitation. Dinner and overnight in Jerusalem. May 15 Transfer to Tel Aviv airport for our flight to Munich. Upon arrival, transfer to hotel. Dinner and overnight in Munich. 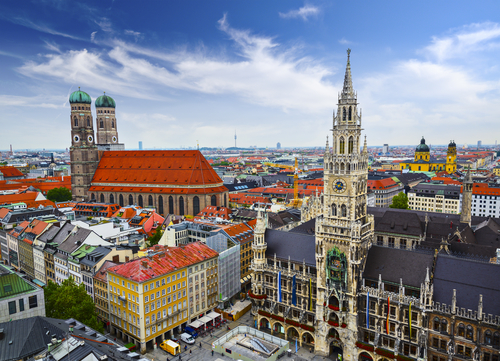 May 16 Morning, tour the city of Munich. We visit Marienplatz with its Old and New Town Halls and the gothic Frauenkirche. Afternoon, excursion to Altotting, one of Germany’s most celebrated shrines. Upon arrival we’ll celebrate Mass at the center of the pilgrimage complex, the Chapel of Mercy. The chapel houses a 13th century statue of the Blessed Virgin to which numerous miraculous cures are credited. 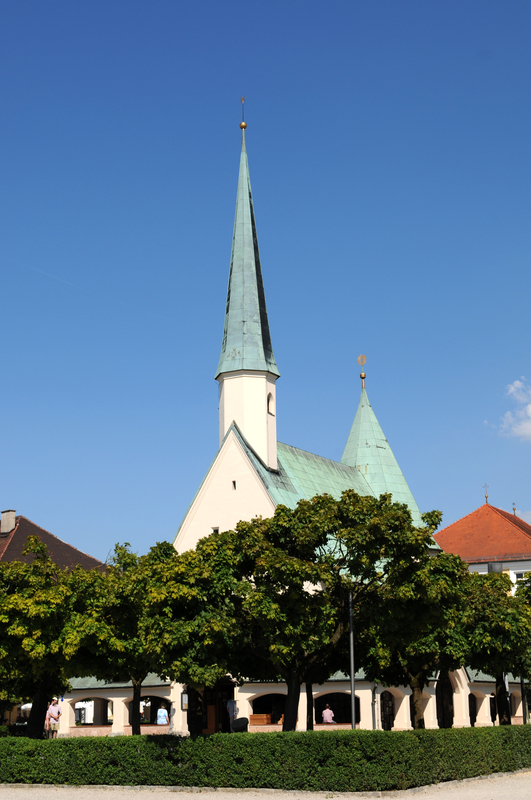 While there, we have the opportunity to visit the Basilica, the Panorama of the Crucifixion and St. Konrad’s Monastery. Dinner and overnight in Munich. May 17 Morning departure to the beautiful scenic village of Oberammergau where we are going to attend the famous Passion Play. In 1634 the Black Death has decimated Europe’s population. Oberammergau remained untouched until a homesick villager returned one night, unknowingly bringing with him the dreaded plague. Almost one hundred villagers died as a result. Frightened survivors vowed that if God saved them from the plague, once every ten years they would re-enact the agony and crucifixion of Christ. From then on there were no further deaths from the plague. The villagers have fulfilled their pledge ever since. The play portrays The Passion of Christ – from the entry into Jerusalem to the Resurrection. Dinner and overnight in Oberammergau area. May 18 After breakfast, transfer to Munich airport for our return flight to Toronto. Roman Catholic chapel at Mount of Beatitudes near Lake Kinneret, Israel. Skyline of the Old City at he Western Wall and Temple Mount in Jerusalem, Israel.